Mooching through some newsletters of the Arms and Armour Society today I came across a deeply sarcastic reference to a myth I’d never encountered before. It was with reference to Dan Cruickshank’s “What the Industrial Revolution Did For Us“. In a frankly hilarious scene that I’d really love to see myself, Cruickshank, dressed in a Napoleonic Rifleman’s uniform and in cover behind a tree, uses his long sword bayonet to skewer a loaf of bread and place his shako on top. He proceeds to wave this contrivance in the air in order to draw the fire of the enemy and allow his imaginary brothers in arms to pinpoint the location of the shooter and return fire. Just, as they say, “wow”. As this blogger‘s comment suggests, this doesn’t even pass the BS sniff-test, let alone stand up to analysis. But debunking myths is fun, so I thought I’d have a go at this one myself. The term “Use your loaf ” comes from WW1 when trench warfare played a large part in battle. Sniperfire was rampant so if a soldier who had been lying in a trench for some time and popped his head up to see if all was clear he’d be likely to lose it. 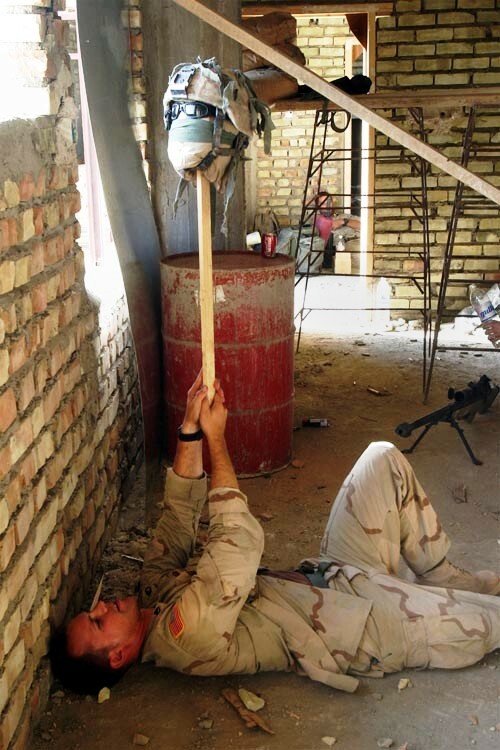 So instead they used to stick a loaf of bread from their rations on their bayonet and raise that in the air instead. Just thought i’d share that one for ya readers. Yes, thanks for that. Some sort of evidence might have been nice. Hell, just a reference to follow. Use your loaf of bread. I would say that this explanation immediately renders the BBC explanation redundant, but I suppose it’s just possible that the latter might somehow have been in currency before entering Cockney English. So let’s look at the history and the practicalities of the scenario. The form of bread supplied in British rations of either period is unlikely to be the sort of large light-coloured loaf that we’re familiar with today. Most likely large dark coloured flat loaves or little rolls, especially if we’re talking about rations portable in a soldier’s knapsack or beltkit. Nothing large or “white” enough to pass as a British soldier’s noggin, even just as a filler. We also have to consider the reason for even using a lump of bread. If an enemy soldier can be confused by some bread and a hat on a bayonet, they can surely be equally bamboozled by the world-beating field expedient measure of…just using the headgear (or even the slightly more elaborate attempt being made by the US soldier in the opening image). Then there’s the tactical advantage (if any) afforded by doing this. Granted, it makes a certain amount of sense in trench or even urban modern warfare, to do something like this to reveal the location of a sniper. Papier mache heads were certainly used in the First World War, as no doubt were more ad hoc measures. If there’s any truth in the myth, bread products notwithstanding, I think it lies in that conflict. But here, we’re talking about the age of linear tactics, smokeless powder, and brightly-coloured uniforms. Accurate individual weapons were in their infancy, making encounters between riflemen pretty rare. Your average infantry soldier fighting in an open field wouldn’t have the opportunity, means, ore the skill to engage a man hiding behind cover. Finally, even the rifles of the age were effective only at a couple of hundred yards. If you couldn’t glimpse your enemy (who, let’s remember, is already firing at you and therefore producing smoke and muzzle flash) in order to return fire at that range, I would suggest that getting him to fire one more shot at something that wasn’t you, wouldn’t help. Needless to say, something like this scenario may well happened at some stage – but it was never doctrine, there’s no written evidence of it, and using a loaf to do it makes no logical sense. So this was either a bad joke at the expense of the viewer, or just another example of lazy thinking, ignorance, and crap TV research. Which reminds me of the legendary cannon-firing dog of Fontenoy!